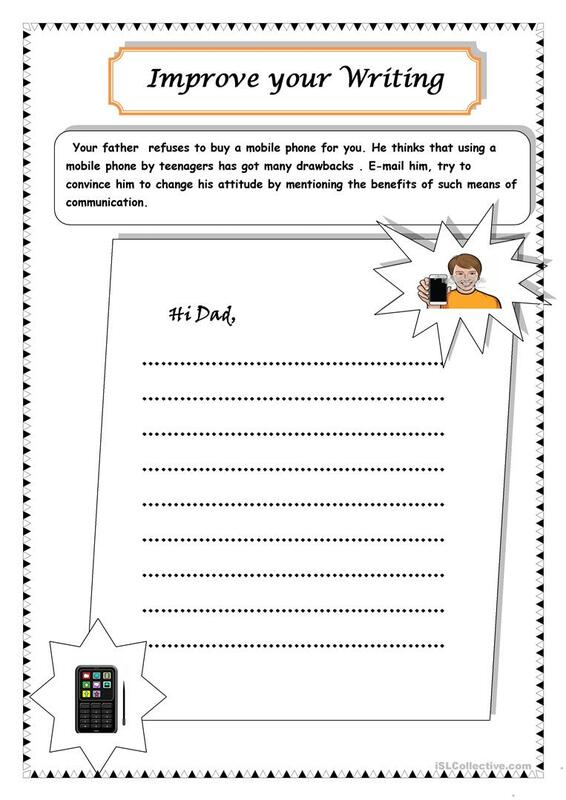 writing: write an e-mail to your father . Try to convince him to buy you a mobile phone. Talk about the advantages of having a private mobile phone. Use the right expressions to convince him. This downloadable teaching material is recommended for elementary school students at Elementary (A1) level. It is aimed at revising Conjunctions (aka connectives, e.g. and, but, or, so, then) in English, and is a valuable material for honing your groups' Writing skills. It centers around the vocabulary topic of Smart phones, tablets and gadgets. lellaelbeya is from/lives in Tunisia and has been a member of iSLCollective since 2013-11-03 19:12:14. lellaelbeya last logged in on 2019-04-12 22:40:44, and has shared 7 resources on iSLCollective so far.